Smoking a trout whole with the skin on gives it protection against the low and slow smoking process that might otherwise make the trout dry out or give it too strong of a smoky flavor. 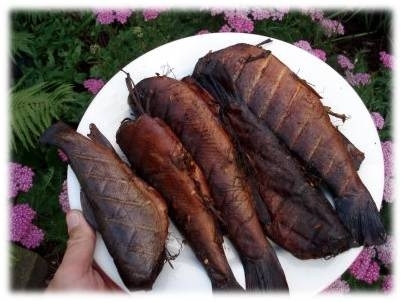 If you use this smoked trout recipe with the skin on, it will turn out with a more tender and juicy fillet of fish that is not over smoked. Just like all fish, trout is a good dinner option if you want a smoked meat and don't have time to smoke a large cut of meat like a whole smoked chicken. Smoking trout usually only takes about 2 hours, unlike some whole smoked meats that can take up to 8-10 hours. Start this trout recipe by mixing all of your ingredients together in a dish to marinade the trout. Cut slits in the skin of the trout so the marinade mixture can penetrate the trout fillet meat. Marinate all of the ingredients with your trout except for the sliced lemon. The sliced lemon will be used to place on top of the trout while smoking. Marinate for 2-4 hours prior to smoking the trout. Soak your wood chips and light your smoker. It will take about 30 minutes for a charcoal smoker to become hot and ready with a glowing white ashy color. Wrap your wood chips in an aluminum foil pouch or a place in a metal smoker box. Make sure you punch holes in the pouch so the smoke can escape the pouch. Place the trout directly on the grates of your smoker and place a couple lemon slices on top of each trout. Make sure the vent at the top is all the way open for the proper air flow and temperature to keep the smoker hot. Adjust the vent so it is positioned above the trout, if your grill lid is adjustable. Check the trout after 2 hours. See below for more information about smoker cooking times and how to determine when your trout is done. The cooking time will take approximately 2 to 3 hours total to smoke the trout. There is not as much emphasis on making sure the trout is completely cooked throughout compared to red meats. There is one simple test you can always perform with fish to check for doneness. Simply insert a piece of metal, a fork or a meat thermometer work best, in the middle of the trout and leave it there for 5-10 seconds. Then simply pull it out and feel the end of it to determine if it is warm or not. If it is warm you know your fish is done and you can pull it off the smoker. You can also check to see if the trout has turned to a flaky texture with a white color. See our meat doneness chart for a full list of different meat internal temperatures.